Quadrant Engineering Plastic Products (Quadrant EPP) announces a product update within its Metal-detectable ("MD") product family: Ketron® MD PEEK is available in Blue color. Effective immediately, Quadrant is producing its Ketron® MD PEEK polymer in BLUE colour. This metal-detectable polymer was formerly produced in GREY color that needed to be replaced since blue color is an important trending standard for plastic components that are operated in modern food processing lines. Ketron® MD PEEK Blue is the preferred product for high temperature applications (up to 250 °C for continuous use) in the food processing industry and is part of Quadrant's "MD" family of metal-detectable polymers. These features are used for visual, X-ray and metal detection for contamination of food products that contribute to the overall food safety. and belongs to Quadrant's "Food Grade" product family (EU 10/2011 compliance). All products are characterised by blue or dark-blue color. - Declaration of Compliance for Materials and Articles intended to come into Contact with Food. 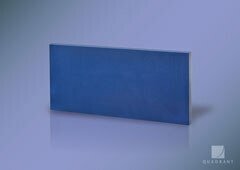 Ketron® MD PEEK Blue is available in rod size up to diameter 120 mm and in plates up to thickness of 50 mm.